Attach to a character. Attached character gains the Noldor and Silvan traits. Limit 1 per deck. Response: When this stage is defeated, each player may search the top 10 cards of his deck for an ally and put it into play under his control. Each player who did shuffles his deck. Attach to a Noldor or Silvan hero. Action: Discard a card from your hand to give attached hero +1 Attack until the end of the phase. Limit 3 times per phase. You must use resources from 3 different heroes' pools to play this card. Action: The players, as a group, can put up to 2 allies into play from their hands. Each of these allies may enter play under any player's control. At the end of the phase, return each of those allies that are still in play to their owners' hands. Action: All enemies get -1 Attack until the end of the phase. Valour Action: Choose a player. Each enemy engaged with that player gets -3 Attack until the end of the phase. 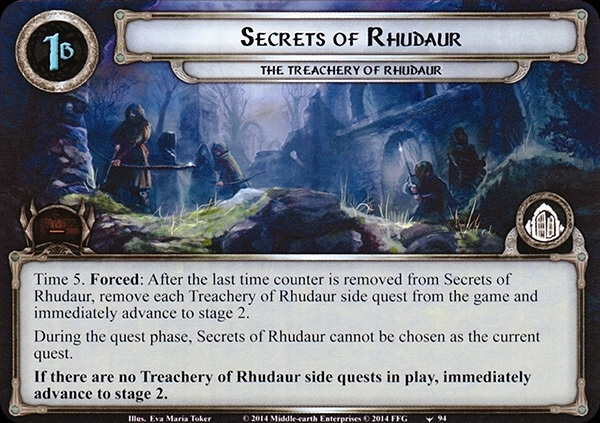 Forced: After the last time counter is removed from Secrets of Rhudaur, remove each Treachery of Rhudaur side quest from the game and immediately advance to stage 2. 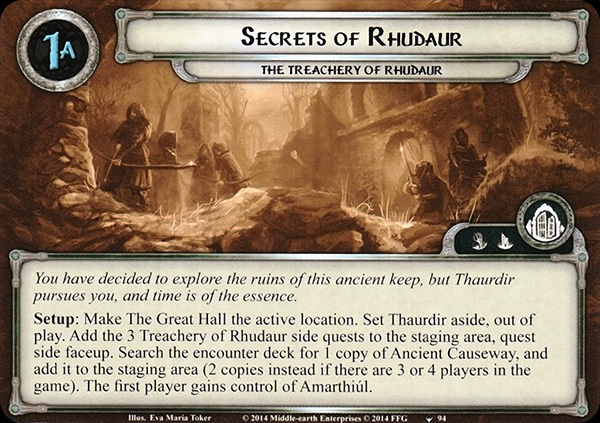 During the quest phase, Secrets of Rhudaur cannot be chosen as the current quest. If there are no Treachery of Rhudaur side quests in play, immediately advance to stage 2. Thaurdir's Pursuit has -5 quest points for each Clue objective attached to a character. This stage cannot be defeated while Thaurdir has any hit point remaining. If this stage is defeated, the players win the game. Response: After an enemy engages a player, give control of Amarthiúl to that player. If Amarthiúl leaves play, the players lose the game. Cannot have attachments. Forced: After a treachery card with the Sorcery trait is revealed from the encounter deck, Thaurdir heals 3 damage and makes an immediate attack against the first player. While the current quest has 1 or more progress on it, Wight of Rhudaur gains surge. While the current quest has 0 progress on it, Wight of Rhudaur gains doomed 2. 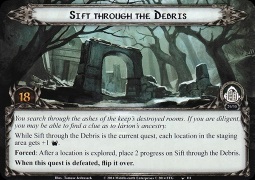 While Forbidden Descent is in the staging area, the first 2 progress that would be placed on a quest each round must be placed on Forbidden Descent, instead. Forced: If Forbidden Descent leaves play from the staging area, raise each player’s threat by 2. Any time the encounter deck runs out of cards, return the topmost Undead enemy in the encounter discard pile to the staging area before resetting the encounter deck. Travel: Return the topmost Undead enemy in the encounter discard pile to the staging area. When Revealed: Each player must exhaust a character he controls. Attach Haunting Fog to the current quest. (Counts as a Condition attachment with the text: "Attached quest gets +6 quest points." 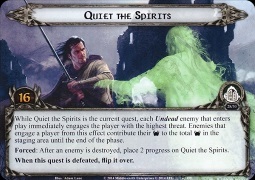 While Quiet the Spirits is the current quest, each Undead enemy that enters play immediately engages the player with the highest threat. Enemies that engage a player from this effect contribute their Threat to the total Threat in the staging area until the end of the phase. Forced: After an enemy is destroyed, place 2 progress on Quiet the Spirits. When this quest is defeated, flip it over. While Sift through the Debris is the current quest, each location in the staging area gets +1 Threat. Forced: After a location is explored, place 2 progress on Sift through the Debris. When this quest is defeated, flip it over. Action: Exhaust Amarthiúl or a hero to claim Heirloom of Iârchon. Then, attach Heirloom of Iârchon to that character. Attached character gets +1 Willpower. 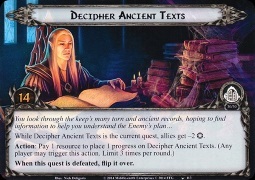 While Decipher Ancient Texts is the current quest, allies get –2 Willpower. Action: Pay 1 resource to place 1 progress on Decipher Ancient Texts. (Any player may trigger this action. Limit 3 times per round.) When this quest is defeated, flip it over. Action: Exhaust Amarthiúl or a hero to claim Orders from Angmar. Then, attach Orders from Angmar to that character. Attached character gets +1 Defense while defending against undead enemies.